China’s Aizhai Extra Large Suspension Bridge has opened today allowing motorists to cross over a canyon – at 1,102ft. 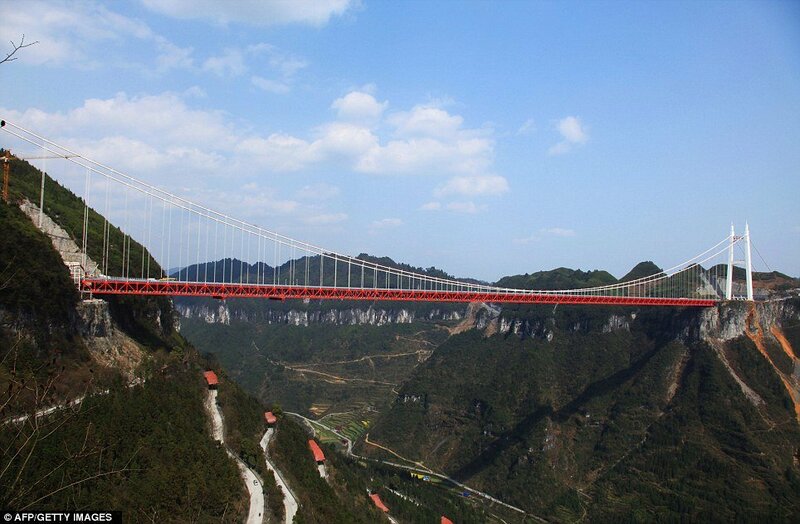 Aizhai Extra Large Suspension Bridge is now the world’s highest and longest tunnel-to-tunnel bridge. Work started on the feat of engineering in October 2007 and the bulk of the work finished at the end of last year. The record-breaking bridge is designed to ease traffic in the Jishou area of Hunan province and officially opened to motorists today. Drivers can take in the views of the Dehang Canyon as they steer their way across all 3,858ft of the new sky-high road which links two tunnels. The bridge, which is lit up at night with 1,888 lights, is the fourth suspension bridge to cross a valley so wide it seems to be connecting two mountain ranges. Once on the bridge cars and lorries can motor along a two-way, four-lane motorway at about 50 mph. Pedestrians can also walk along it on a special walkway under the road. The bridge is a key part of the Jishou-Chadong Expressway, a 64-kilometre road which has 18 different tunnels which cover about half of its length. It is hoped the bridge will help ease traffic jams which are common in the mountainous area which has narrow, steep and winding roads. The structure is supported by a base 78 ft wide. China is has the longest bridge in the world, the Danyang Kunshan Grand Bridge which is just over 100miles long and was built two years ago to carry the Beijing–Shanghai high-speed railway.